Fresh and vibrant, this robust salad gets a surprise kick from the spicy jerk marinade. Combine quinoa, avocados, vegetables and cheese in large bowl. Mix lime juice, oil, honey and 1/4 cup marinade until blended. Add to quinoa mixture; mix lightly. Toss shrimp with remaining marinade; thread onto 4 skewers. Grill shrimp 1 to 2 min. on each side or until shrimp turn pink. Spoon quinoa salad onto 4 plates; top with shrimp. 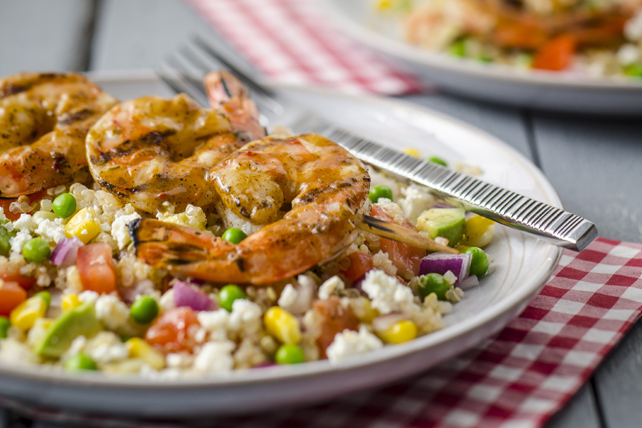 To instead cook the shrimp in a skillet, heat remaining marinade in large nonstick skillet on medium-high heat. Add (unskewered) shrimp; cook 2 to 3 min. or until shrimp turn pink, stirring frequently. Serve over prepared salad. Prepare using Cracker Barrel Crumbled Feta Cheese with Oregano, Sun Dried Tomatoes and Black Pepper. Or, omit the cheese altogether - the salad is just as delicious.